Business people and experts from the French National Front party leader Marine Le Pen’s close circle may have been involved in illegal offshore schemes, local media reported Tuesday, citing alleged data leaks from the Panama-based firm Mossack Fonseca. 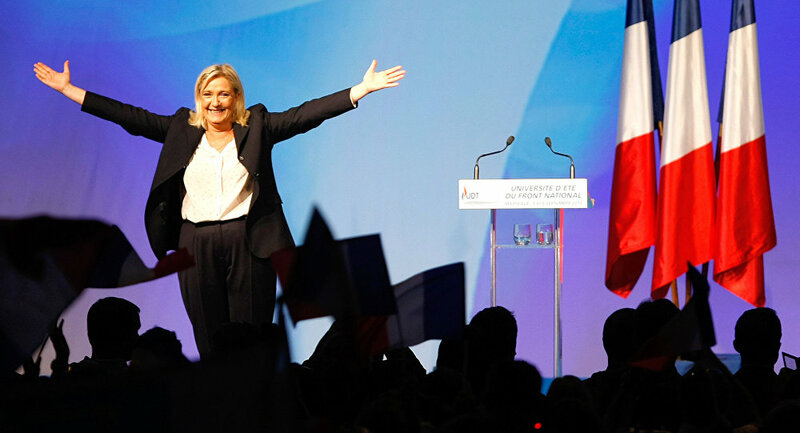 MOSCOW (Sputnik) — According to the Le Monde newspaper, people close to Le Pen may have been transferring money through a complex system involving companies in Hong Kong, Singapore, Panama and the British Virgin Islands. Their alleged plan was to extract money from France, bypassing local anti-money laundering measures. According to the publication, businessman Frederic Chatillon and a former adviser to Le Pen on the economy, Nicolas Crochet, may have been involved in the scheme. Both are defendants in an investigation into the financing of the politician’s election campaign in 2012. On Sunday, the German newspaper Sueddeutsche Zeitung exposed the alleged involvement of multiple former and current world leaders in offshore schemes by publishing materials it claims came from Mossack Fonseca, a Panama firm that specializes in selling offshore companies. Mossack Fonseca has refused to verify the information contained in the leaks but accused reporters of gaining unauthorized access to its proprietary documents. It warned that using unlawfully-obtained data was a crime that it would not hesitate to pursue through the courts.